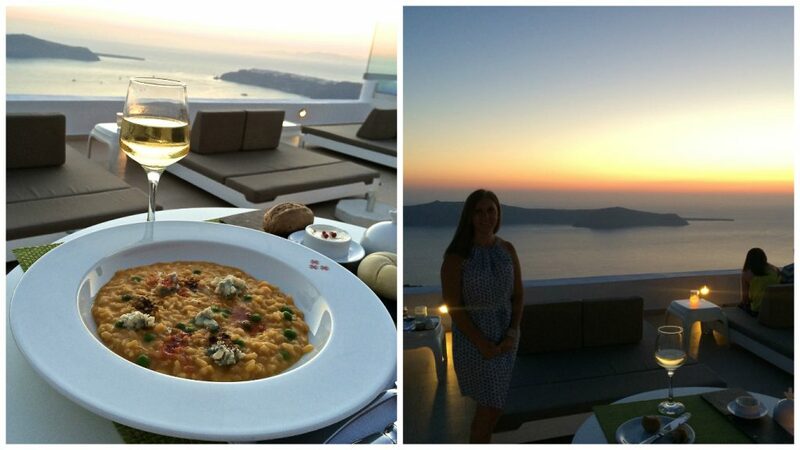 You don’t have to head to one of the restaurants in Oia to watch a magnificent sunset in Santorini. 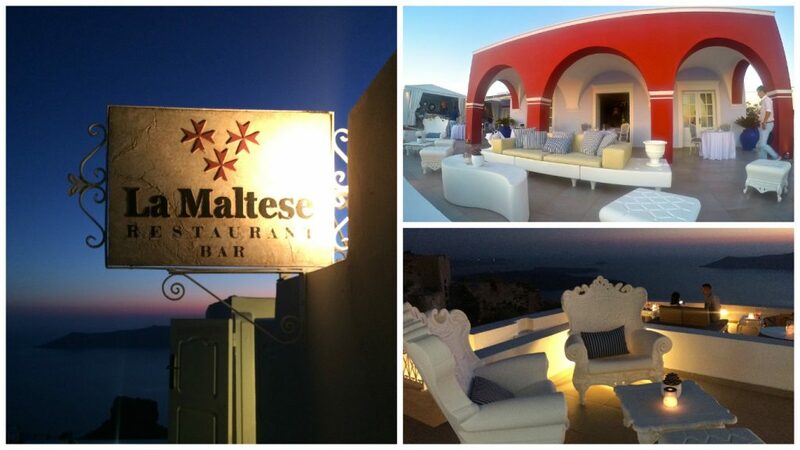 You can also get a fabulous view from La Maltese Restaurant and Bar in Imerovigli. La Maltese is located on the highest point of the island, giving you a unique view of the Caldera and Oia, with the sun slowly going down on the horizon. I happened upon this place whilst I was actually looking for another venue to sit, have a wine and watch the sunset. I peered into the entrance, it was wonderfully opulent and I thought possibly this may be a bit on the expensive side. 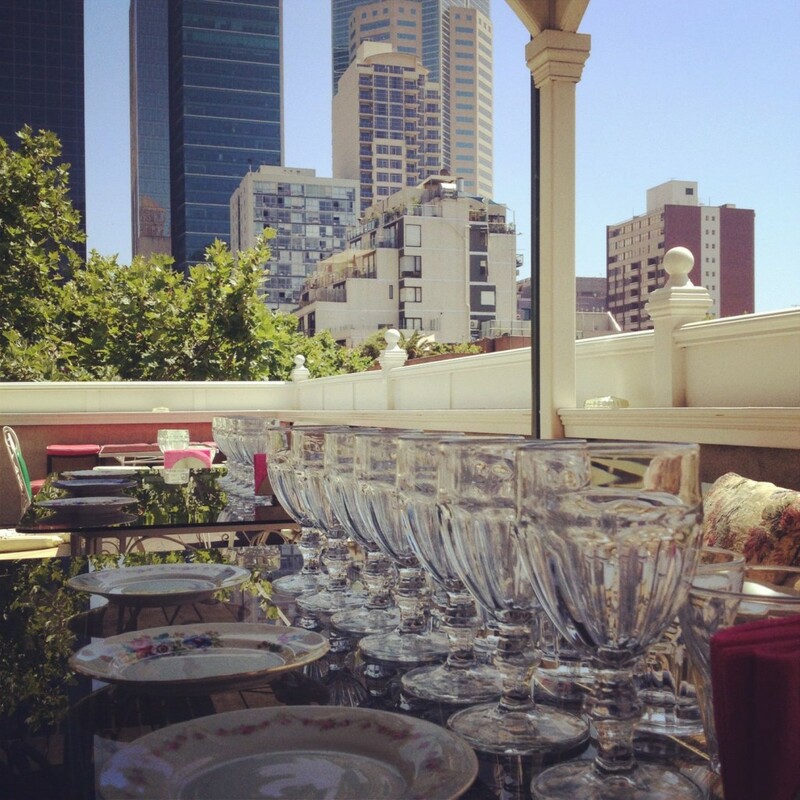 I wandered in and found myself out on the terrace – immediately I was wowed by the view. Aside from the view, the terraced area really catches your eye. 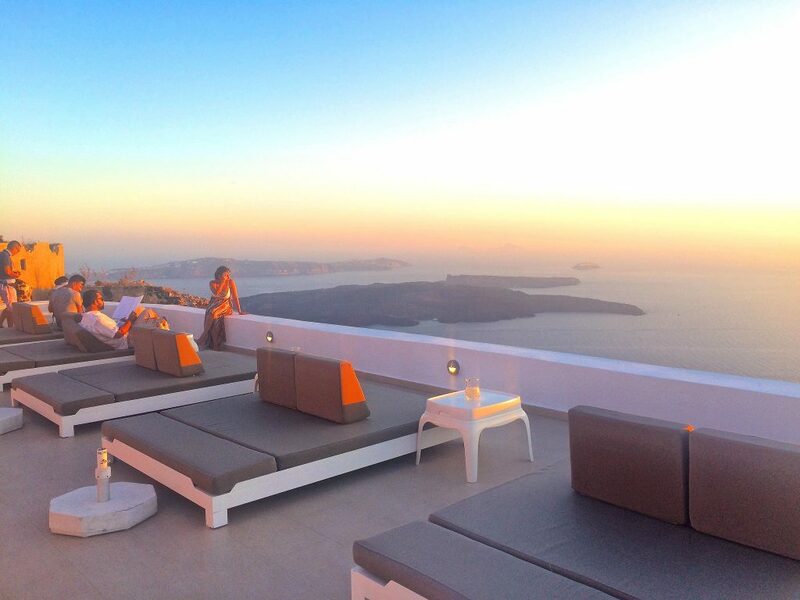 It just exudes a feeling of luxury, complete with day beds set in position for watching the sunset. The terraced area is over two levels, with the daybeds down on the lower section and above is the more informal lounge bar area. 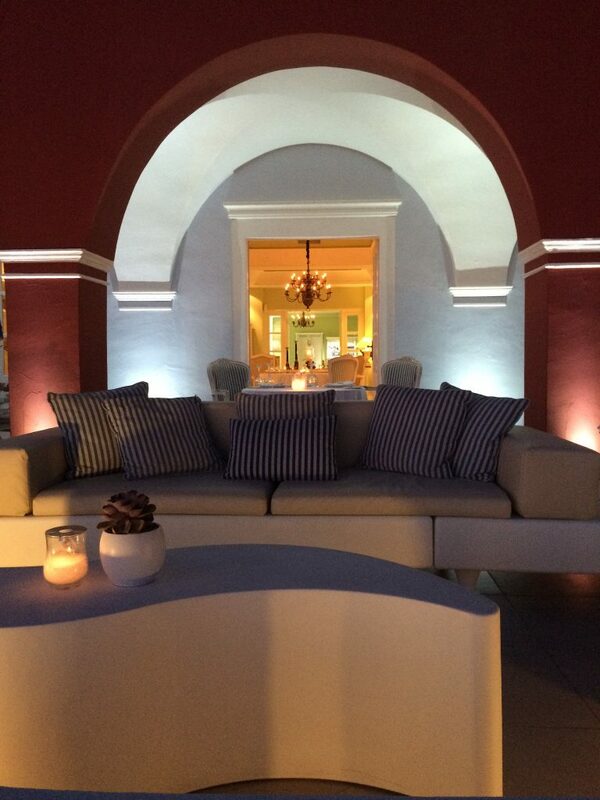 There is also a formal dining area that spills out under an arched terrace. 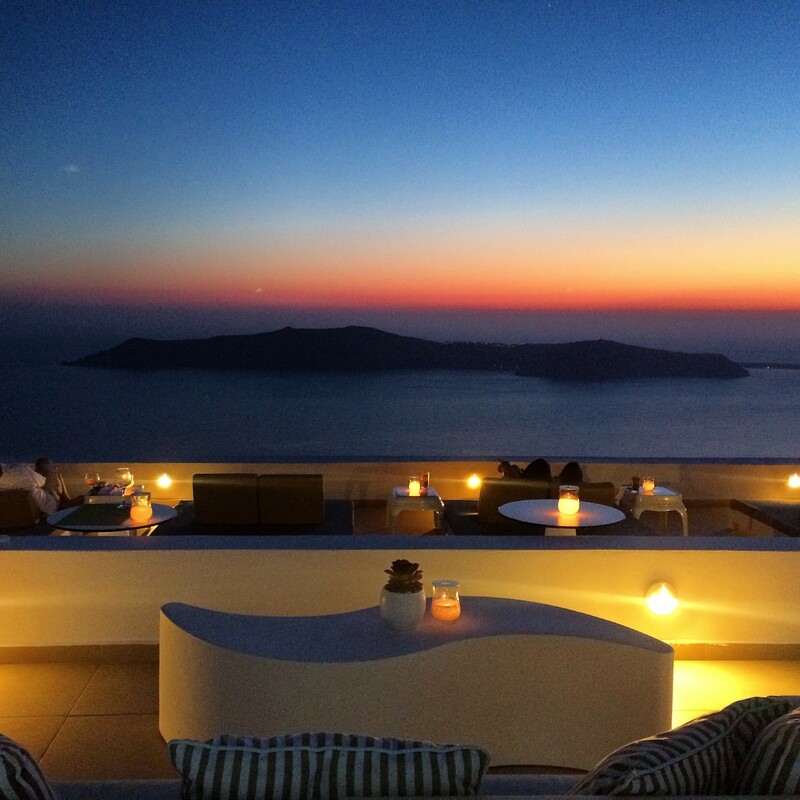 The beautiful sunset you can expect to see every night from the terraced area. The staff were very welcoming and greeted people on arrival, offering to get you a drink or whether you might stay for something to eat. I ordered a wine and then ended up staying for dinner as well. It was such a nice place to just sit and enjoy the peacefulness. There was no overly loud music and people seemed to become in tune with the serenity, it was as though there was an understanding, no words were needed, as taking in the view said it all. 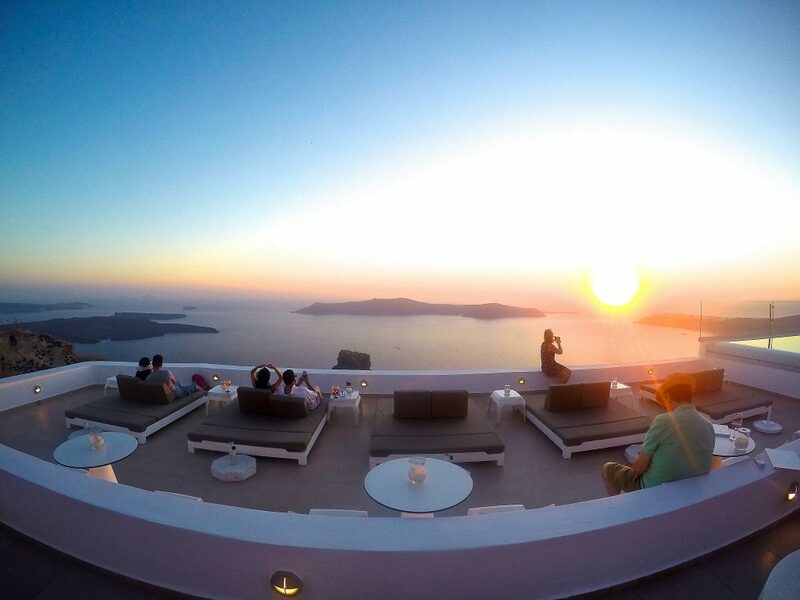 All I can say is that the atmosphere is beautiful and if you find yourself in Santorini, make sure you visit this place to view the sunset. People wandered in and out to catch a view of the sunset and take some photos. The lounge bar area, with a view inside of the more formal restaurant. 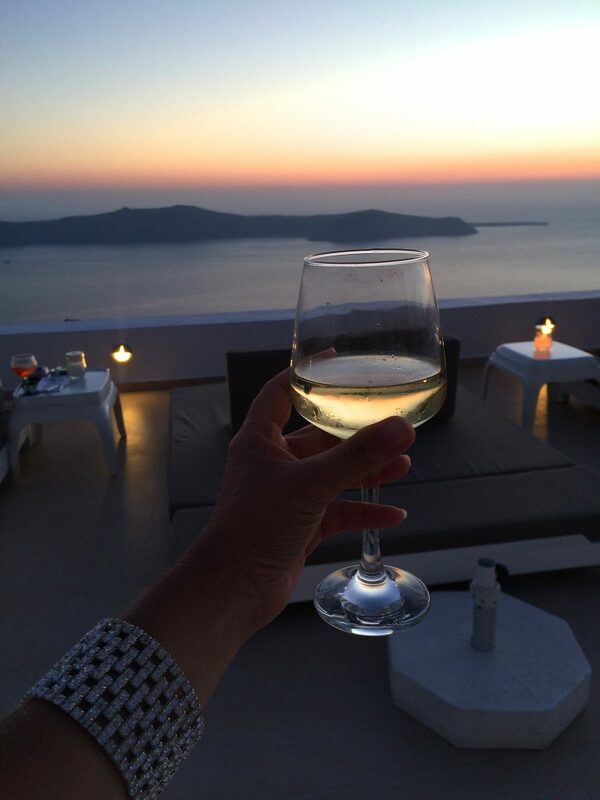 Cheers to a magnificent Santorini sunset. 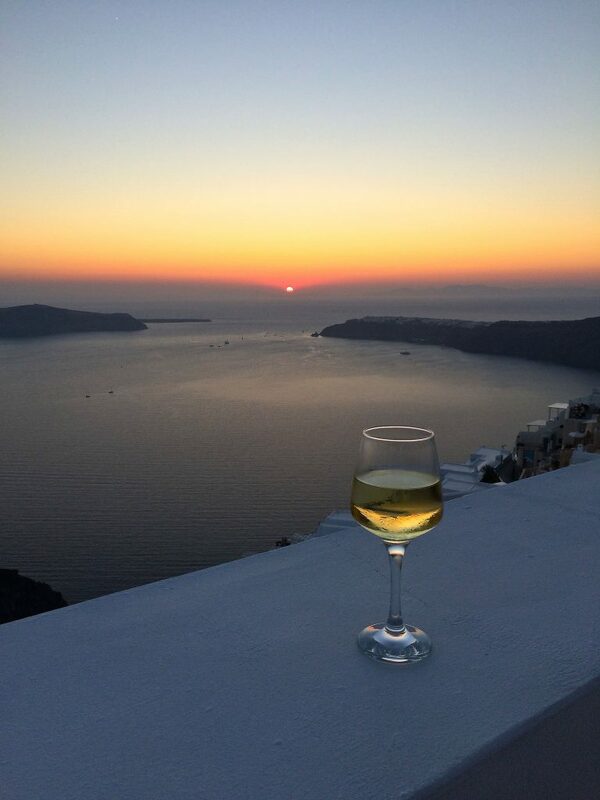 I haven’t been to Santorini in some time and almost forgot how beautiful the sunsets were there. Your photos do them justice and that is not easy. Thanks for sharing!! Yes aren’t sunsets amazing every night! Santorini was my favourite place on this trip, just spectacular. Thanks for the compliments on the photos, these were an extra challenge as my DLSR camera had died on this trip (read devastating), so a lot of effort was put into getting these shots right on my iPhone. Not an easy challenge in low light conditions! Santorini really is a magical place and I’d love to get back there again one of these days. Meanwhile, I’ll live vicariously through your photos here. Sorry about the DSLR – seriously bad timing and hope you were able to get it repaired or replaced fast. I had the mirror on my Canon 5D pop out onto the sand about a year ago, but the 7D is just a workhorse and keeps on going despite a ton of use and some challenging conditions at times (knock on wood). You did great with the iPhone though! Ah thanks and yes really bad timing with the camera as Santorini was the one place I was excited about getting night shots. Oh well, I guess another excuse to go back! What bad luck about your camera mirror too … that’s the thing about cameras they seem to malfunction at the most inconvenient times! Totally agree, the iPhone isn’t too bad really. I just had a look at your photo of the sunset, very nice, along with the waterfall and how you captured the water perfectly! Thanks Wendy! Glad you liked the photos. Waterfalls are probably my favorite subject, although I’ve really been enjoying experiments in light painting with night skies and the Milky Way lately. Any excuse really to get out and explore somewhere.